NCKAS 2011 – This is our online logging of observing sessions throughout the year. I wanted to start keeping a better and easier log of all the observing we do. 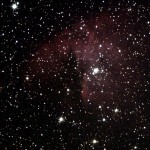 12-15-2011: Hunting in Cassiopeia. We used Sue French’s DSW Dec. 2009 article from Sky and Telescope to hunt these faint targets down. Many of them are somewhat hard to discern because of the enormous number of background stars all over Cassiopeia. It’s such a wonderful experience to sweep a large dob through though. Pretty much any view is breath-taking. The night was exceptionaly crisp and clear with a very steady atmosphere. Click on each DSS image for a larger version. This is a smal triangle of blue stars in the same field of view with a low power magnification of Caph, (β Cass), Using a 16″ reflector at 130X, a faint “fog” halo is seen around each of the stars in this little blue triangle. 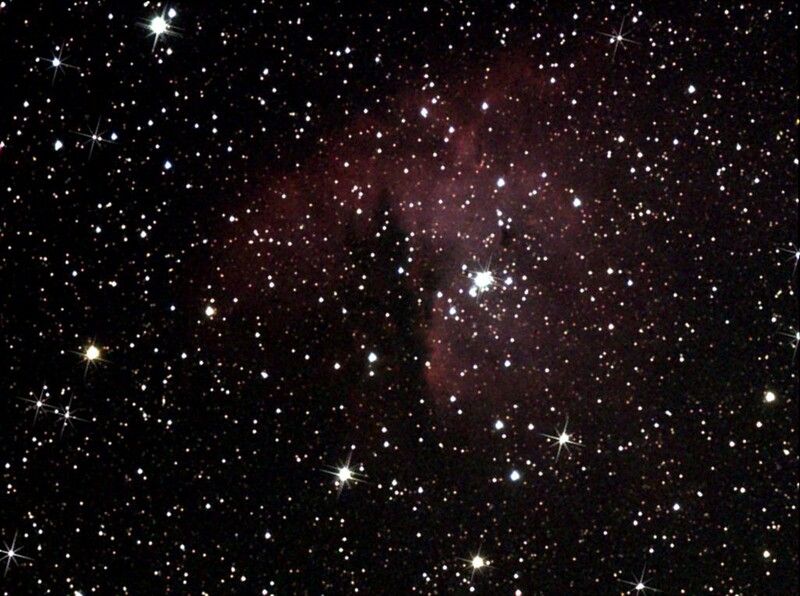 The emission nebula to the upper left was not viewed. This very faint galaxy is essentially just a background brightening viewed with a 16″ reflector at 52X. It’s quite large with little resolution at all and is easily missed if you are not looking for it. One of those targets you almost have to convince you are viewing. This is a gorgeous orange-red Carbon Star in Cassiopiea. The compainion, a chance alignment star and not a true binary system, is a wonderful blue contrast to the striking color of WZ Cass. At ~7 Mag., this Carbon Variable is within the grasp of most any telescope. The closer double at the top upper right, around 2 o’clock, is the small binary system Stein 1248. The both looked yellow to me with the brighter one perhaps having a slight orange hue. We view all these with a 16″ reflector at 130X. This open cluster is pretty hard to discern against the background of stars. In fact, with the exception of “loops” or “U”s of star chains, I would be hard pressed to pick this out. Used a 16” reflector at 52X. This open cluster is a very interesting object. It looks like a sprinkling of diamond dust inside a fat square parallelagram. Used the 16″ reflector at 52X. This open cluster is very large and diffuse but more easily discerned from the background of stars. They stand out a bit more than some of the rest of the clusters here. Although the overall appearance is a delicate sprinkle of diamonds. Again the 16″ dob at 52X. We could not bag this one. It shouldn’t too hard though and I think we were looking for a much larger object. Imaged this with an ST-8300C through an Astro Tech 65EDQ APO @ f5.0. This is a stack of 10 5 minute guided One-Shot-Color images from my driveway. Loads of light pollution. Captured with Nebulosity and processed in MaximDL, Nebulosity and Gimp.